For these speakers I used Seas 27TDFC/TV tweeters, Scan-speak 18S/8531G woofers, 1cft parts-express cabinets and 6.5in MCM waveguide. 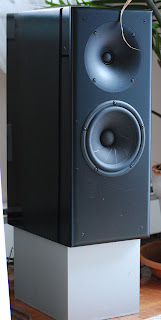 These are my main speakers, they have very non fatiguing sound. I can listen to them entire day without getting tired. I use separate amps for tweeters and woofers. I slightly lowered tweeter's amp gain, so if I used single amp, I'd use a bit larger resistor in series with tweeters.